On 16th of September 2018 an urgent meeting of Afghanistan WILFP Board members was held in NECDO main office to appoint a representative for the upcoming anniversary of 1325 UNSCR to be held in New York NY. 1. TO share Information on upcoming anniversary 1325 UNSCR with the Board Members. 2. To elect and introduce one of the members of Afghanistan WILPF section to participate in anniversary 1325 UNSCR in New York. On September16th WILPF urgent meeting was hold in NECDO main office. The meeting was attended by Ms. Jamila Afghani President WILPF Afghanistan Section, Ms.Toorpekai Momand Vice President WILPF Afghanistan Section, Ms. Prana Jahaid Ms. Masooda Waisy and Ms. Hamida Lasani. The meeting was chaired by Ms. Jamila Afghani who welcomed the participants. She talked about the criteria of a representative to the anniversary 1325 UNSCR. She said that WILPF had given Afghanistan WILPF section the opportunity to attend the program. Then Ms. Jamila Afghani explained and gave details about the anniversary 1325 UNSCR. She added that the main issue of today’s meeting is to select a member of Afghanistan WILPF Section to attend the anniversary 1325 UNSCR, which is going to be held by WILPF in New York and one of WILPF board member of Afghanistan group has to expose life and condition of Afghan women to the world and also present WILPF of Afghanistan section activities and so far achievements. She mentioned if all members of Afghanistan WILPF section agree we will do to the election to elect one of the board members to this. All participants voted to select Ms. Jamila Afghani as a right candidate to represent Afghanistan WILPF section. Ms. Jamila Afghani did promise as Afghan woman and a WILPFer to give the world a message of Afghan women in the event. 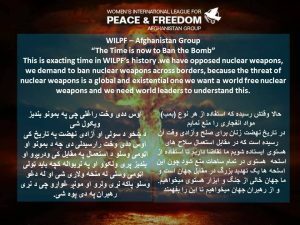 The members of Afghanistan WILFP section wished her success and hope her participation in the event will bring more progress of Afghanistan WILPF section. All members of Afghanistan WILPF group agreed to do the election to choose one of the board members to attend 1325 UNSCR anniversary in New York. And the participants voted to sending Ms., Jamila Afghani as a right candidate to represent Afghan WILPF section. Ms. Jamila Afghani was selected to represent WILPF Afghanistan section in the upcoming event. All members expect from Ms. Jamila Afghani to address the following two points. · Present full information about 1325 UNSCR in Afghanistan to the anniversary participants. · The massage of Afghan woman to be delivered to the world through this anniversary as an opportunity and hope for a change.